“Remember Nicholas Carr? 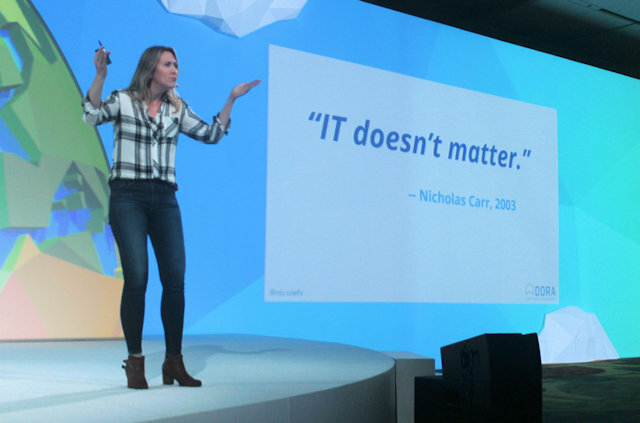 He actually had a point,” stated Nicole Forsgren during her keynote address to close CloudBees’ DevOps World 2018 in San Francisco last month. She was referring to the best-selling former editor-at-large of Harvard Business Review who in 2003 published an article entitled “IT Doesn’t Matter.” There, Nicholas Carr suggested that the novelty of information technology was already wearing thin, and that it would eventually find its permanent place in the global economy alongside refrigeration, locomotion, and all the other formerly exciting commodity services. “Back in the ‘80s and ‘90s, the days that Nicholas Carr was writing his article about,” Dr. Forsgren continued, “all we did was we bought technology, we plugged it in, we walked away. Or we bought something, installed it, and we left. It was kind of amazing, because it was easy. We were on ‘easy mode,’ we checked it off our list, we collected our fat bonus checks, and we left. 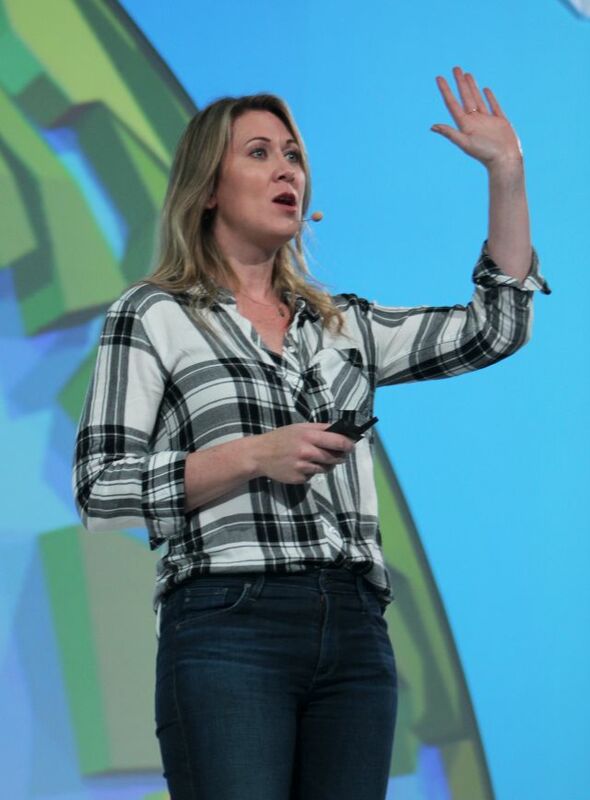 We’ve introduced you to Dr. Forsgren in The New Stack before; she’s the CEO of DevOps Research and Assessment (DORA), and the principal researcher for the annual State of DevOps study, the most recent edition of which was published just weeks ago. 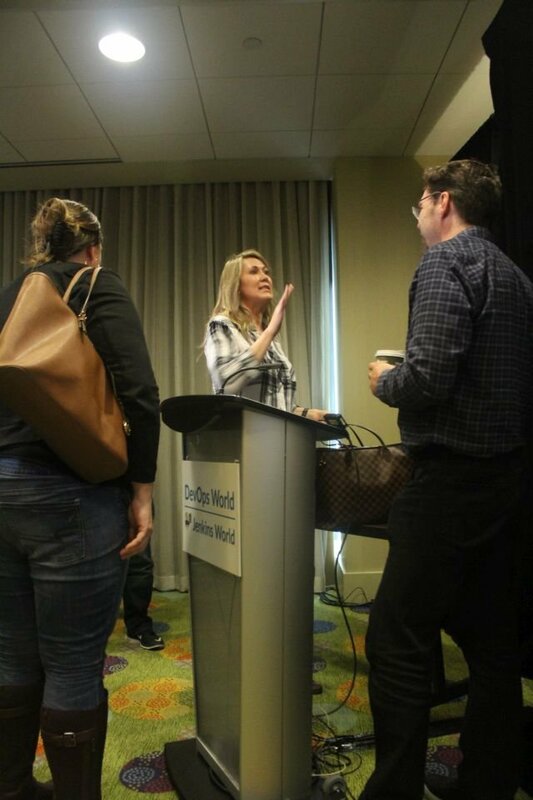 Her latest book, entitled Accelerate: Building and Scaling High Performing Technology Operations, was also recently published, and the book-signing ceremony here stretched out like a queue for a major concert or an iPhone release. It’s absolutely fair to say she has a disarming, often captivating, certainly commanding, stage presence. Carr, in the intervening years since that article was published, has had to resort to other methods to attract people’s attention. Currently, his personal blog features a 5,800-word recitation of the various published citations of his work by others, most of whom appear to have disagreed with his premise, or perhaps just with his title. We do live in an era, after all, when being publicly disputed manages to give one a sense of validation. So it might come as bad news to Carr that Forsgren validated a good portion of his premise in fewer than 100 words — certainly shorter than the average Facebook post. Her kind words, however, were just a staging ground for the eventual sting. “If that’s how you view technology, you’re doin’ it wrong,” she asserted, followed by a pause that spoke at least as loudly as the statement itself. The very phrase “information technology” derives from a movement to isolate and identify classes and elements of work that are “undifferentiated” — that contribute a minimum of consumer-perceived value, if any at all — and to remove as much human effort expenditure from that work as possible. 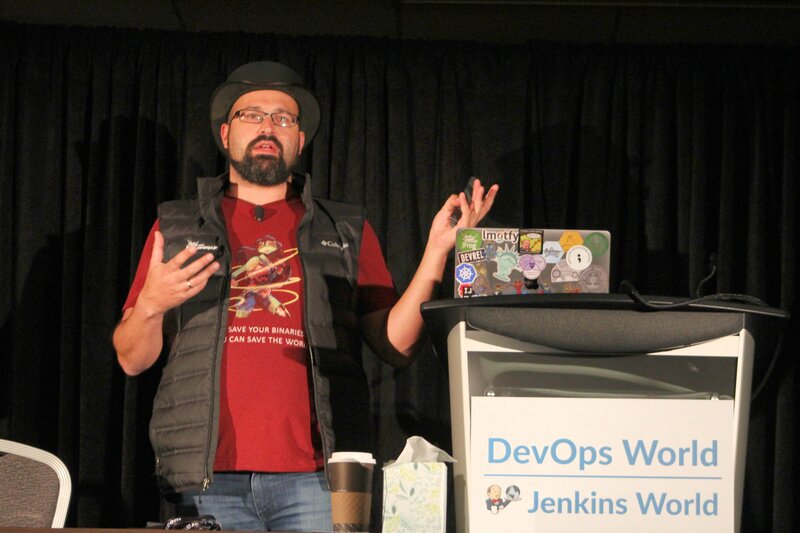 DevOps is only the latest permutation of this movement. Some perceive this removal as implying a delegation of talent to a task that does generate value; others view it as a necessary component of corporate downsizing. Either way, it leaves both organizations individually, and the global economy as a whole, faced with perhaps millions of highly skilled, experienced workers, in a trade that is transitioning away from them. Several of these people are looking to heroes for help. It’s only fitting that one of these heroes looks like he could have been drawn by Bob Kane. 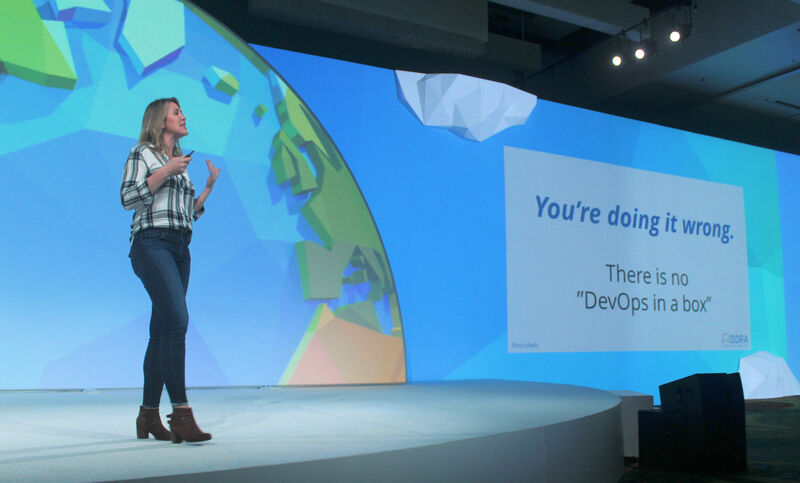 “You need to give a s__t,” declared Baruch Sadogursky, head of developer relations for software development pipeline service JFrog. Wearing a red T-shirt, a parachute fabric vest, a black top hat, and sporting a prominent black beard visible from the opposite side of a soccer stadium, Sadogursky has developed his own uniquely successful means to attract and hold an audience’s attention. His point is that automating the software and service delivery processes of an organization is not an automatic process — in short, that automation is not automatic. It requires the same class of human effort and oversight that IT operations professionals, formerly charged with automating infrastructure and “keeping the lights on,” have always provided. As he told his audience, JFrog itself has had to undergo similar procedural adjustments itself. A decade ago, when there were fewer options for how QA processes could take place, he said, JFrog had a large team of release engineers. Its release cycles were considered fast back then — three months, a mere quarter of a year. Since that time, the company has moved to a model that Sadogursky calls liquid software. In fact, in a book with co-authors Fred Simon and Yoav Landman, he’s working to make this phrase officially coined. JFrog managed to make this transition while letting go of zero engineers from its original workforce. “Not only we didn’t fire anything; we actually tried to hire, and cannot find enough people,” he said. 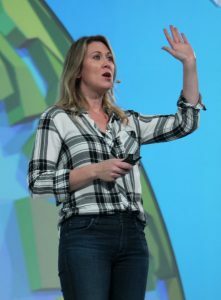 Sadogursky referred to data from what he called “Nicole’s report” (in this segment of the industry, everyone knows who “Nicole” is), revealing that the software release cycles of the highest-performing organizations in her study were over 2,500 times faster than those of low performers. That data is evidence enough, he believes, that a properly managed transition should leave few casualties in its wake. “This fear is really not justified,” he pronounced slowly. One of the points that she may have had the most difficulty getting through to listeners (even the ones who perceive her as “Nicole,” or for whom I suggested to her we print “Team Nicole” T-shirts) is that the metrics she so highly values in her work should not represent the outcomes for the organizations that put them to use. In other words, the measurements themselves should not be the barometers of success for any organization, but rather the outcomes of those metrics put to positive use. Metrics are indicators, and as she’s said on multiple occasions, the metrics an organization chooses to value over others will directly translate to its values, and even its morals. But metrics are not goals, just as speed itself is not the finish line. Baruch Sadogursky and Nicole Forsgren represent two voices of inspiration and hope in this often scary and uncertain industry. I think we may need about 2,500 times more of these people if we expect to make it through this next decade. CloudBees is a sponsor of The New Stack. 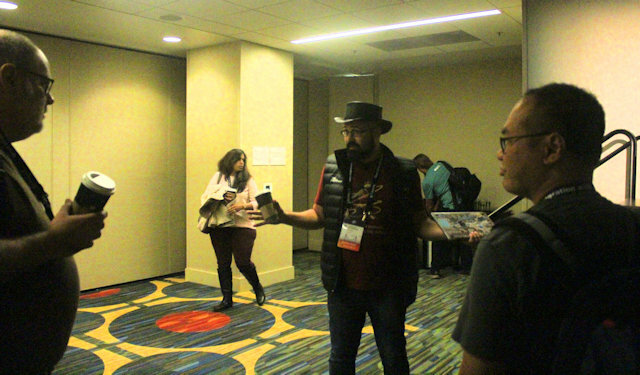 The company helped pay travel costs for the reporter to attend DevOps 2018. Photography by Scott M. Fulton III.